Aguadilla is known as La Villa del Ojo de Agua (village of the eye of water). Aguadilla is also known as El Pueblo de los Tiburones (town of the sharks), and recently El Nuevo Jardín del Atlántico (the new garden of the Atlantic). Aguadilla was founded in 1775 by Luis de Córdova. Aguadilla derives its name from a name given by the Indians Guadilla or Guadiya which means garden. Aguadilla is best known to visitors for its beaches. Aguadilla's most popular surfing beaches include Crash Boat, famous for it's crystal clear waters, Gas Chambers, and Wilderness. Among Aguadilla's main attractions you will find the popular Parque Acuático Las Cascadas, a modern aquatic theme park, the biggest in the Caribbean (tel. 787-819-1030), and the Merendero, with a beautiful view of the town's bay and the nearby Desecheo islet. The Christopher Columbus Park is located in a small forest at the southernmost beach of Aguadilla. The park harbors a romantic boardwalk along the beach. The town center is known as Plaza de Recreo, located in front of the old catholic church and the Alcaldía (Major's House). Another of Aguadilla's attractions is the Ojo de Agua (water eye), this is an underground fresh water source that anciently was used by the Aguadilla Harbor in times of Spanish Occupation. The city is also home of the Aguadilla Ice Skating Arena, the only ice skating facility in the Caribbean region. (tel. 787-819-5555). Aguadilla was home of the Ramey Air Force Base and its former base airport was converted into Rafael Hernandez Airport, considered one of the most active commercial airports on the island. The paved runway extends for 11,701 feet. The facility is at an elevation of 238 feet at a distance of about 3 miles from Aguadilla, owned by Puerto Rico Ports Authority. The Punta Borinquen Lighthouse, built in 1889, has been designated a historic site worthy of preservation by the National Register of Historic Places (tel. 787-891-1005). 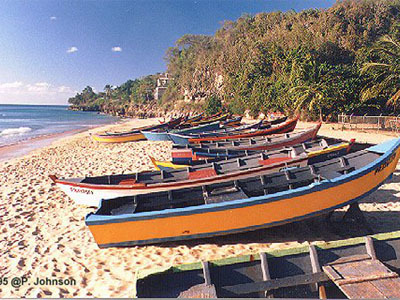 Crash Boat Beach - A popular surfing and sports beach located just north of Aguadilla on the west coast. Located on Route 458, off Route 107. Rafael Hernández Monument - Monument to the memory of such as composer Rafael Hernández considered one of the most important figures in 20th-century popular Puerto Rican music. If you are looking for a place to stay during your next trip, you have few choices in Aguadilla. The Cielo Mar Hotel offers air conditioned rooms, equipped with private baths, refrigerator, cable TV, telephone, and the majority with private balcony and sea view, (787) 882-5959. La Cima Hotel offers 40 air conditioned rooms, with cable TV, phones and daily room service, (787) 890-2016. Parador El Faro is a hidden gem located between 17 acres of tropical terrain in Aguadilla, (787) 882-8000. The town is a processing and trading center for agricultural products such as: sugar, coffee, fruits, tobacco, and cotton. Aguadilla territory is mostly flat because the city it is located on the Western Costal Valley, bordering the Atlantic Ocean, north of Aguada and Moca; and west of Isabela. Aguadilla highest peak is Jimenez Peak (222mt, 728 ft) and the largest river is Culebrinas. Aguadilla annual precipitation is 54 inches, and its average temperature is 78°F. September is the warmest, January is the coldest, October is the wettest and March is the driest month. Every year, Aguadilla celebrates a patron saint festival. The festivities include dances, food, parades and religious processions. The flag was designed on 1972 following the recommendations of the Puerto Rican Institute of Culture for the occasion of the 200th Anniversary of the city foundation. It consists of two horizontal bands of equal size, blue the upper one and gold (yellow) the lower one, the predominant colors of the Coat of Arms, being this placed at the center of the flag. The anthem was written by Rafael Hernandez Marin. The title is Playita Aguadillana. There are 27 public schools in Aguadilla, education is handled by the Puerto Rico Department of Education. Aguadilla is also home of 3 colleges and universities.